To extend the life of diesel engines in use, we must strengthen the air filter, oil filter and fuel filter maintenance of the three filters, give full play to their role. Air filter installed in the installation can not be missed, reversed, or the wrong equipment and rubber gaskets to connect the tube, and to ensure the rigor by embedding Department. Use the paper air filter dust cup every 50-100 hours of work, 1 to remove dust, use a soft brush to brush the surface of dust, if more than 500 hours of work or is damaged, it should be replaced. Use oil-bath air filter every 100-200 hours of work, clean the filter with clean diesel, and replace one of the oil, if the filter has been broken, they need to be replaced immediately, and note in use, according to the provisions of add oil. Use in diesel engine oil filter, if not timely maintenance, filter clogging, oil pressure increases, the safety valve opens directly into the main oil lubricating oil, lubricating the surface of the wear will increase, affecting the life of diesel engines. Therefore, the oil filter every 180-200 hours of work, we should wash one time and found damaged should be replaced immediately to prevent debris from entering the lubrication surface. 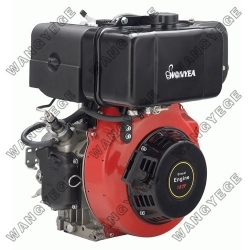 Seasonal use of diesel engines, but also cleaning and the lubricated surface of the crankcase, the method is to use oil, kerosene and diesel oil mixture made after cleaning, lubricating oil can be added after washing the oil clean release, then, the diesel engine at low speed for 3-5 minutes, came alive again to make washing the oil, add new oil. Fuel supply system in a variety of fuel filter every 100-200 hours of work, it should be clear debris or replacement of a 1, and a full fuel tank and clean the pipeline. Especially for electronically controlled common rail system, due to high precision injection, dual fuel system parts, high precision, with the gap is small, the filtration efficiency of the fuel filter and water separation efficiency have put forward higher requirements. Currently use two-stage filtration system, an oil-water separator, a diesel fine filters, water demands greater than 95% separation efficiency, particle filtration efficiency 3-5 micron filtration efficiency greater than 98.6%. Currently the company to meet the performance requirements of major European and American companies such as Bosch (BOSCH), filtered extraordinary (Luber Finder), Fleetguard (Fleetguard), Man Hu (Mann-Hummel), Parker (Parker), etc., of domestic Buffett (DIFITE) and so on. In the routine maintenance should be particularly careful, unusual, or mileage and time requirements to reach the engine, the need for timely replacement. Oil change in the transition season, the response of the entire fuel supply system for cleaning parts. The use of diesel, should be consistent with seasonal requirements, and subject to the 48-hour precipitation purification.